Remember that the unemployed are those who are out of work and who are actively looking for a job. We can calculate the unemployment rate by dividing the number of unemployed people by the total number in the labor force, then multiplying by 100. Figure 1. Employed, Unemployed, and Out of the Labor Force Distribution of Adult Population (age 16 and older), 2016. The total adult, working-age population in 2016 was 253.5 million. Out of this total population, 151.4 million were classified as employed and 7.7 million were classified as unemployed. The remaining 94.4 million were classified as out of the labor force. As you will learn, however, this seemingly simple chart does not tell the whole story. Based on the data in Table 1, what’s the unemployment rate in 2016? 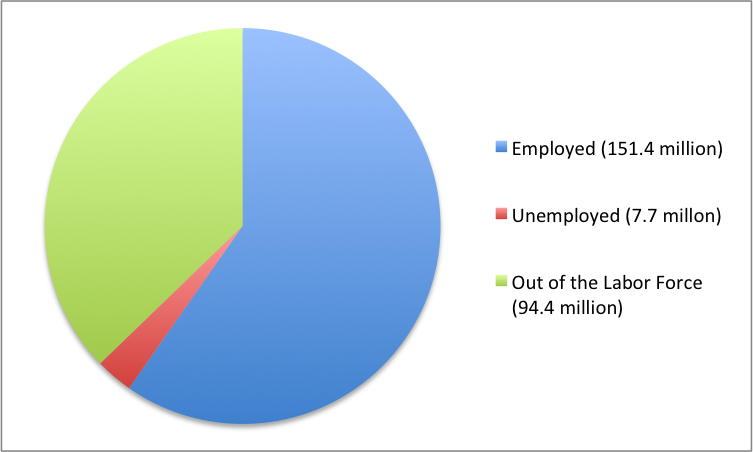 In this example, the unemployment rate can be calculated as 7.7 million unemployed people divided by 159.1 million people in the labor force, which works out to an 4.8% rate of unemployment. Read on to walk through the steps of calculating this percentage. So how do economists arrive at the percentages in and out of the labor force and the unemployment rate? We will use the values in Table 1 to illustrate the steps. Step 1. Divide the number of people in the labor force (159.1 million) by the total adult (working-age) population (253.5 million). Step 2. Multiply by 100 to obtain the percentage. Step 1. Divide the number of people out the labor force (94.4 million) by the total adult (working-age) population (253.5 million). Step 1. Divide the number of unemployed people (7.7 million) by the total labor force (159.2 million). Step 2. Multiply by 100 to obtain the rate. Even with the “out of the labor force” category, there are still some people who are mislabeled in the categorization of employed, unemployed, or out of the labor force. There are some people who have only part time or temporary jobs and who are looking for full time and permanent employment that are counted as employed, though they are not employed in the way they would like or need to be. Additionally, there are individuals who are underemployed. This includes those that are trained or skilled for one type or level of work who are working in a lower paying job or one that does not utilize their skills. For example, an individual with a college degree in finance who is working as a sales clerk would be considered underemployed. They are, however, also counted in the employed group. All of these individuals fall under the umbrella of the term “hidden unemployment.” Discouraged workers, those who have stopped looking for employment and, hence, are no longer counted in the unemployed also fall into this group. Another important statistic is the labor force participation rate. This is the percentage of adults in an economy who are either employed or who are unemployed and looking for a job. So, using the data in Figure 1 and Table 1, those included in this calculation would be the 159.2 million individuals in the labor force. The rate is calculated by taking the number employed, divided by the total adult population and multiplying by 100 to get the percentage. For the data from 2016, the labor force participation rate is 62.8%. In the United States the labor force participation rate is usually around 66-68%, though it has declined over the last decade. When the unemployment report comes out each month, the Bureau of Labor Statistics (BLS) also reports on the number of jobs created—which comes from the establishment payroll survey (EPS). The payroll survey is based on a survey of about 140,000 businesses and government agencies throughout the United States. It generates payroll employment estimates by the following criteria: all employees, average weekly hours worked, and average hourly, weekly, and overtime earnings. One of the criticisms of this survey is that it does not count the self-employed. It also does not make a distinction between new, minimum wage, part time or temporary jobs and full time jobs with “decent” pay. The unemployment rate announced by the U.S. Bureau of Labor Statistics each month is based on the Current Population Survey (CPS), which has been carried out every month since 1940 by the U.S. Bureau of the Census. Great care is taken to make this survey representative of the country as a whole. The country is first divided into 3,137 areas. Then 729 of these areas are chosen to be surveyed. The 729 areas are then divided into districts of about 300 households each, and each district is divided into clusters of about four dwelling units. Every month, Census Bureau employees call about 15,000 of the four-household clusters, for a total of 60,000 households. Households are interviewed for four consecutive months, then rotated out of the survey for eight months, and then interviewed again for the same four months the following year, before leaving the sample permanently. Based on this survey, unemployment rates are calculated by state, industry, urban and rural areas, gender, age, race or ethnicity, and level of education. A wide variety of other information is available, too. For example, how long have people been unemployed? Did they become unemployed because they quit, or were laid off, or their employer went out of business? Is the unemployed person the only wage earner in the family? While both the Current Population Survey (CPS) and the Establishment Payroll Survey (EPS) both provide reports about jobs, the CPS measures the percentage of the labor force that is unemployed, while the EPS measures the net change in jobs created for the month. There are always complications in measuring the number of unemployed. For example, what about people who do not have jobs and would be available to work, but have gotten discouraged at the lack of available jobs in their area and stopped looking? Such people, and their families, may be suffering the pains of unemployment. But the survey counts them as out of the labor force because they are not actively looking for work. Other people may tell the Census Bureau that they are ready to work and looking for a job but, truly, they are not that eager to work and are not looking very hard at all. They are counted as unemployed, although they might more accurately be classified as out of the labor force. Still other people may have a job, perhaps doing something like yard work, child care, or cleaning houses, but are not reporting the income earned to the tax authorities. They may report being unemployed, when they actually are working. Although the unemployment rate gets most of the public and media attention, economic researchers at the Bureau of Labor Statistics publish a wide array of surveys and reports that try to measure these kinds of issues and to develop a more nuanced and complete view of the labor market. It is not exactly a hot news flash that economic statistics are imperfect. Even imperfect measures like the unemployment rate, however, can still be quite informative, when interpreted knowledgeably and sensibly.